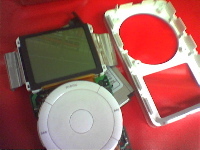 I opened the case on my iPod tonight to see if I could fix the FireWire problem I’ve been having. This photo essay walks through the process of actually opening the iPod and revealing the problem. When you finally get everything out of the iPod, and move the LCD away to reveal the front of the board, you can see the FireWire connector is soldered to the integrated circuit board in nine places. Four, at the corners of the metal box that forms the frame of the FireWire port, appear to be mostly structural connections that may also ground the frame to the circuit board. The remaining five are thin leads that come off the bottom of the port. I got out my silver solder and my grounded soldering iron and connected the larger connections on the side, then with the residual solder on the tip of the iron reconnected the thin leads. Just like Operation, it takes a very steady hand. Then I reassembled the iPod, grabbed the charger, plugged it in… and waited. And I’m still waiting. When plugged into the wall, the iPod stayed stuck at the Apple logo, and while I could get it to restart (Menu and Play buttons held down simultaneously) I couldn’t get the diagnostic menu to come up (Previous, Next, and Select buttons). I reset it and briefly got a main menu, and even a song title, but nothing else. I also can’t get it to mount on the computer, though it’s definitely charging. I think the thing is just rattled; I’m going to leave it charging overnight and see how it goes. I may need to try soldering the thin leads again—I think those are the data leads, and if I screwed them up it would explain why the iPod isn’t being recognized. Soon the columns, weblogs and airwaves will be full of people instructing us that we must “never forget” what happened in New York City, Washington DC and the sky above western Pennsylvania two years ago. As if any of us could or would forget the despicable acts that took place that day, the heroism, the damage, the wasted lives. What they really mean is not “remember,” but dwell. Obsess. Lingeringly finger the scab. And most of all, fall in line when assured that some grand policy, however wise or unwise, is put forth in the name of that day and the atrocities that marked it. For me, I think if we’re still in mourning even as we invade and remake nations, we are in danger of seeing the decisions we must face through eyes clouded with the smoke of the past. So I am going to let others remember the day, and I’m going to continue to do my part by asking questions about actions taken in the names of the fallen that I believe do them no honor.